We design start to finish, curated, senior living marketing plans for tech-savvy seniors, referrers, and influencers. Total Marketing begins with Bloom surveying those who matter most to your community: your residents and their families. Bloom also interviews the owner and any other key stakeholders in the community. The purpose of this is to gather data on current perceptions of the community and to analyze marketing performance thus far. Need a custom plan? Sign up for a complimentary 30-minute discovery session phone call today. Measurable Results and Higher Occupancies. Bloom Takes Care Of All Development of The Marketing Platform and Delivery of All Tactics Therein. This marketing plan will not be the mix that we will recommend for your senior living community, but it gives you an idea of how the marketing plan may look. It will include several different tactics, from each area of the marketing mix, giving you a well-rounded strategy. 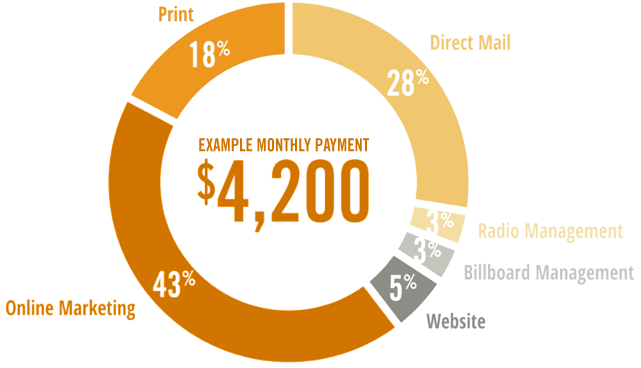 In this case, set budgets are allotted appropriately across six marketing tactics: direct mail, radio management, billboard management, website, online marketing, and print. Over the course of 12 months, Bloom delivers the tactics included in your marketing plan with top-notch service and impeccable expertise. With these services also comes access to our cutting-edge reporting and analytics platform that displays results in real time. Interested In A Total Marketing Assessment? Let us know a few services you may be interested in as well as a brief description of your communities needs and we will get back to you right away! *Your email is safe with us. Our occupancies have stabilized at about 98% for several months now. Bloom designs marketing materials through strategy and with the goal of filling occupancies, not just creating something that looks good. They did an excellent job of understanding who we were trying to attract and designed to that demographic. I have learned so much from the marketing experts at Bloom. They offer fresh ideas and strategies that truly work.